This is the Cigar Galaxy, otherwise known as NGC 3034 or M82. This galaxy is ‘nearby” it’s at a neighborly distance of 12-million light-years, in the constellation of Ursa Major. The galaxy itself is classified as a starburst galaxy. 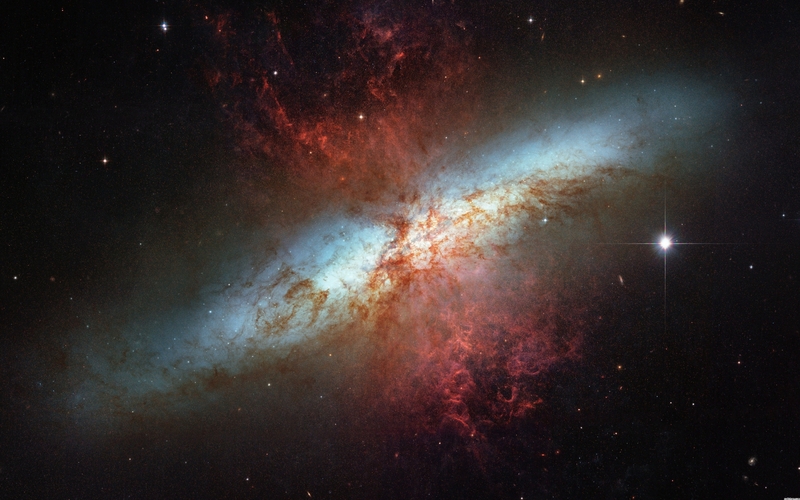 As a whole, M82 is 5 times brighter than the Milky Way. Up until recently, M82 was thought to be an irregular galaxy, but astronomers have since discovered two spiral arms. Interestingly enough, radio astronomers discovered an ‘unknown object’ within the Cigar Galaxy in 2010. I can’t elaborate too much on it because it’s… unknown. We haven’t a clue what it is. This object started to send out radio waves in 2010 and, to date, we haven’t seen anything like it before. There have been a few theories proposed to explain the phenomena, but none of them fit quite right, there is always something missing from the explanation. So, for now, study and further observation is all we can do. This particular image is the sharpest wide-angle mosaic ever taken of the Cigar Galaxy. It was obtained by the Hubble Space Telescope in 2005, and it shows visible and infrared wavelengths as well as light emission from hydrogen filaments. The image reveals 197 young massive star clusters near the galactic center. The red plumes you see are created by the stars and span a distance of about 20,000 light-years. I strongly suggest you check out the large high-definition image for this picture here, it’s positively stunning.